The MSE Equity Total Return Index continued to trade in negative territory as it added to the previous week’s loss with another 0.594 per cent decline. The index closed the first full week of trading for 2019 at 8,903.539 points. The equity market was dominated by selling pressure as from the 18 active securities, 11 traded lower while only five posted gains. A turnover of €1.6 million was generated across 180 transactions, which is significantly higher than the €547,000 generated during the previous two-day week. The main contributors for this performance was the banking equities, as the two equities with the largest market capitalisations in the sector drifted lower. HSBC Bank Malta plc oscillated between €1.73 and €1.81 throughout the week, but ultimately settled 4.37 per cent lower at €1.75. A total of six transactions of a combined 10,780 shares were executed over six deals. Last Monday, the company announced that its board of directors is set to meet on February 19, 2019 to approve the bank’s final financial statements for 2018. The board will also consider the declaration or otherwise of a final dividend to be recommended to the bank’s Annual General Meeting, which will be held on April 17. Its peer, Bank of Valletta plc also had a negative week in terms of trading, as it fell to €1.295, having recovered from a weekly low of €1.28. The 1.89 per cent decline in value was the result of heavy trading, as 63 trades of a combined 242,519 shares were recorded last week. The only positive mover in the industry was FIMBank plc, as a single trade of 64,927 shares pushed the equity price up by 1.41 per cent, to $0.72. Telecommunications company GO plc helped minimise the MSE index losses, as it was the best performer of the session with an impressive gain of 6.15 per cent to €4.14, the highest closing price for the equity since September 2006. The company announced that the Prospectus with regards to the proposed Initial Public Offering of 49 per cent of its shareholding in BMIT Technologies plc, has been approved by the Listing Authority. BMIT is the largest data centre provider in Malta and is seeking to access the capital markets by going public. Shares are being offered at €0.49 per share, In total, 20,500,000 shares will be allocated to preferred applicants and to the general public. GO Shareholders and GO Group Employees will be given preference in the allocation policy. GO shareholders appearing on the register as at the Cut-Off Date of December 28, 2018, will be eligible preferred applicants. Preferred Applicants and other investors may submit their applications by latest January 31, subject to a minimum application of 2,000 shares and in multiples of 100 shares thereafter. Prospective investors are to read the prospectus which is now available and seek financial advice. The equity traded heavily as €319,352 worth of shares changed ownership across 26 trades. The most liquid equity however was Malta International Airport plc as a turnover of €335,059 was generated across 19 transactions. The equity closed at €5.90, translating to a 1.72 per cent increase in value. International Hotel Investments plc traded five times as 18,352 shares changed ownership. The result was a 3.23 per cent price drop to close the week at €0.60. Mapfre Middlesea plc continued on a positive path, as it added a further 2.94 per cent to the previous week’s similar gain. The equity reached a nine-month high of €2.10, over four transactions of 11,623 shares. In the Information Technology sector, 11 trades of a combined 74,454 RS2 Software plc shares were all executed at an unchanged price of €1.40. Similarly, Simonds Farsons Cisk plc traded flat at €8.75 over eight transactions involving 13,643 shares. The retail conglomerate, PG plc, partially surrendered the previous week’s gain, as the share price contracted by 1.46 per cent to €1.35. This was the outcome of eight trades worth €111,292. Conversely, Loqus Holdings plc advanced by 2.67 per cent to €0.077 over three deals of 16,900 shares. The worst performer last week was Medserv plc as its share price plunged 7.83 per cent to €1.06. Trading volume totalled 8,250 shares over four transactions. The property sector was another major drag on the index, as all six active equities traded lower. The largest price movement was recorded by Malta Properties Company plc which lost 7.02 per cent in value to close at €0.53. Just one trade of 2,200 shares was executed. Similarly, a single transaction of 5,000 Main Street Complex plc shares shaved 1.54 per cent off the share price, down to €0.64. MIDI plc traded heavily as 124,913 shares changed ownership over 12 trades. As a result, the equity edged lower by 0.75 per cent to €0.665. Malita Investments plc followed suit with a 2.27 per cent decrease in value to €0.86. Turnover amounted to €30,693 generated over just two deals. Likewise, a couple of deals of a combined 5,000 Plaza Centres plc shares dragged the price 1.96 per cent lower to €1.00. Trident Estates plc dipped 1.33 per cent to €1.48, as four transactions of 20,213 shares were registered. Yields in the local sovereign debt market were predominantly higher, as ten Malta Government Stocks headed south, while six gained ground. Turnover generated in the market totalled €4.1 million. The three longest-dated price movers all posted gains, however, the best performer was the 3.3% MGS 2024 (I), as it put on 0.62 per cent to €115. At the other end of the spectrum, the 2.2% MGS 2035 lost a substantial 0.93 per cent in value to €104.45. Performances in the corporate debt market were quite mixed, as gainers amounted to 13, and fallers amounted to 17, over a turnover of €2.4 million. The best performer was the 4.8% Bank of Valletta Plc Sub € 2020 which gained 1.69 per cent to €102.50. 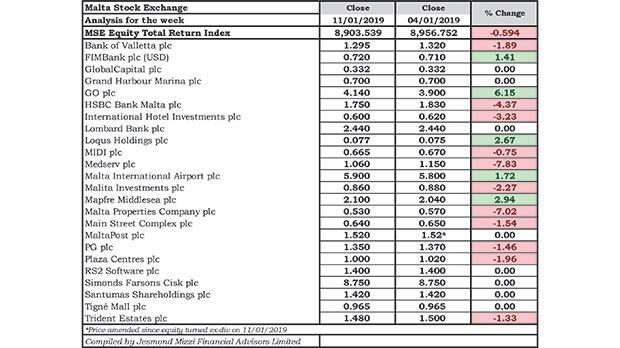 On the other hand, the 4.5% Izola Bank plc € Unsecured 2025 surrendered the gain registered at the end of 2018, to return to the €103 price level. The Prospects MTF market was quite active this week as nine issues were traded. On Wednesday, the 5.5% Testa Finance plc Bonds 2029 was admitted to the Malta Stock Exchange and trading in the security commenced on Thursday, however no trades were executed on its first two days of trading. This article, compiled by Jesmond Mizzi Financial Advisors Limited, does not intend to give investment advice and the contents therein should not be construed as such. The company is licensed to conduct investment services by the MFSA and is a member of the Malta Stock Exchange and Atlas Group. The directors or related parties, including the company, and their clients are likely to have an interest in securities mentioned in this article. For further information contact Jesmond Mizzi Financial Advisors Limited at 67, Level 3, South Street, Valletta, or on Tel: 21224410, or email info@jesmondmizzi.com.